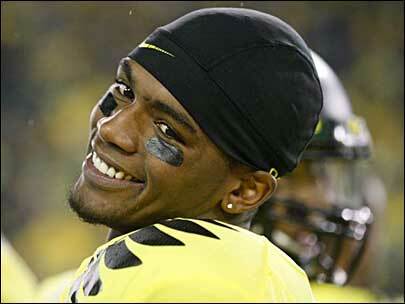 When I started writing this (Friday evening) I had ZERO knowledge of Darron Thomas foregoing his senior year. Having met Darron in the off-season last year and watching him prep the incoming receivers and seeing how hard he trained, and how much of a teacher and leader he was, I just like everyone reading this was shocked at the news of his premature departure from Oregon. I understand this is a very hot topic this week amongst us of the media, the PAC-12, and certainly for us Oregon fans. This week’s insert isn’t about Darron Thomas at all, in fact his decision to leave in no way shape or form changes where I rank the Ducks going into next season. One player does not define a team, and Oregon will now move forward without Darron Thomas featuring a stacked lineup of talent top to bottom. Now rest assured ESPN and their batch of so-called “experts” will probably place Oregon out of the top ten based on the early departures of LaMichael James and Darron Thomas. That’s fine to me, in fact I’d rather have it that way, go ahead and yet again under-estimate the Ducks, I actually enjoy the underdog role, something Oregon has not experienced very often lately. It adds fuel to the fire to dominate and destroy every team Oregon faces, and this season especially if ever there was a good time for two key players to depart in the wake of back-to-back-to-back BCS games and a Rose Bowl victory… This was it. So because it’s never to early to discuss pre-season polls, here are my picks for the 2012 football season. 1) LSU: Regardless of their pathetic attempt at a game in the BCS National Championship last week, the mad hatter returns a deep lineup of veterans, quality talent at nearly every position. They return a ton of starters in 2012 from their 11′ SEC championship roster, and until someone beats the SEC (as much as I can’t stand the SEC) you gotta respect six BCS National Championships in a row, regardless of how much of a joke this last championship game was. Show of hands though, who would have rather seen Oklahoma State play in that game instead of Alabama? Everybody? Yeah, exactly…LSU will be a force to be reckoned with in 2012, but I question whether or not LSU will beat Arkansas in their final regular season game this year, as the Razorbacks return the best offense in the SEC and get back a healthy Knile Davis, and I predict will lose to Georgia in the SEC title game. 2) OREGON : Kenjon Barner, De’Anthony Thomas, Tra Carson, Josh Huff, the “Dream Team” as they’re called. This incoming redshirt freshman class of wide receivers with a year in the system now ready to showcase their talents on the field in Devon Blackmon, BJ Kelly, and Tacoi Sumler (the fastest 40 time on the team) will be special. I wont even start on the dominance of the other side of the ball on defense, as the talent returning is a known commodity. With Thomas’ departure all focus in spring ball and fall camp will be on the quarterback position. Lets look at Bryan Bennett, faster than Darron Thomas ever was, more agile, and with a much more accurate and powerful arm. Then there’s Marcus Mariota, said to be the “best athlete to ever come out of Hawaii” and “the best QB on the roster” by a current player I promised shall remain anonymous for now. All in all this leaves what will be a key position for Oregon on their 4th straight quest for a Pac-12 Conference Title and return trip to a BCS National Championship. For those who recall the Costa vs. Thomas battle from a couple years ago this will be eerily similar, an extremely close QB competition that may not be decided until the final week before the first game. For those doubting a return to success, keep in mind the last time Oregon started a sophomore quarterback for the year without full-time starter experience…yeah, 2010, and all Darron Thomas did was lead Oregon to its first ever national championship game in an undefeated season. Duck fans relax, breathe, don’t cancel your January trip to Miami Beach just yet, Oregon’s schedule is primed to have the Ducks partying with Pitbull (drinking Dr. Pepper I assume), Enrique Iglesias, Tony Montana, Will Smith, Don Johnson, and Justin Gwaltney. So don’t stress, get ready for the joys of spring ball, and hopefully Darron will come down and join all of us, who knows? 3) USC: With Matt Barkley coming back, it’s really going to be a battle this year in the PAC-12. This much can be said about the Trojans, this graduating class (2nd to last of the Pete Carroll recruits) really is USC’s last breath of excellence before they head into some seriously depressing times with the NCAA sanctions not even taking full effect yet. Wait a minute Jared, you mean the 2007, 2009, 2010 where teams that were fully load? Why yes reader that is true, there is no reason why USC was mediocre those years other than the fact Oregon was better. Scholarship limitations kill programs, even ones as prestigious as USC, sure Alabama looks great now but there was a long stretch in the 90s following their sanctions and scholarship restrictions that they could barely compete. Even this past season USC had to play a flawless 3 ½ quarters to barely hang on and win and spend the season hoping no injuries struck, so while all this pre-season hype about them is rather to be expected, the SEC drunken and LA-biased media needs to get their heads on straight. Oregon is the 3-time defending Pac-12 Conference champions. Fresh off a Rose Bowl win with a deep roster of young talent even with a new QB the Ducks are not dropping off any time soon, and while LaMichael James leaving might sting a little, Oregon is still loaded. Not to take anything away from the talent pool on the roster at USC going into this season,as their starting roster is as good as any team in the country, it is their back-ups that become an issue. Regardless of the outcome of the epic Oregon-USC game November 3rd, this will be an impact year for the PAC-12 to take over. 4) Oklahoma: Mike Diet Stoops heading home with his tail between his legs to reunite with brother Bobby in Norman really does makes Oklahoma a scary team going into 2012. They are also returning a lot of starters and will be loaded against a Big-12 conference that doesn’t contain a proven foe with Oklahoma State losing the core of their team in Weeden and Blackmon. There is no one in the BIG/little-12(10) next year that will be able to compete with Oklahoma, Landry Jones will be a senior, Waley was on pace for a 1,500 yard season last year before his injury and should be back at full strength. Usually when the Sooners have a quality 1-2 combo at QB and RB they are deadly, stack that with a stout defense and some golden talent at receivers and it makes for a Sooner Squad ready to turn some heads. 5) BAMA : Pretty hard not to put Alabama in the top 5, I mean what can you really say? Two BCS National Championships in 3 years, wow….Sure they lose Richardson and a few key players on defense, but with the way Alabama has recruited in recent years they have plenty of talent to fill the void. Alabama may struggle though to replace some of their veteran talent leaving for the NFL, I predict a loss to Michigan, and a loss to LSU. So there you have it Duck Fans, your 2012 Pre- Season Top 5. If we know anything about Chip Kelly, he knows what he has on his squad better than any of us, and the Ducks will be ready for their 4th Conference Title run. Will you?